Saveiro is the portuguese word to designate small boats with different shapes, but all 100% built in wood. The most ancient and original ones have even wooden nails. Among the fishermen the Saveiro is also known as "lancha". The Saveiro is a open boat with about 5-6 meters lenght, that used to go to the sea to catch mackerel and horse mackerel through a traditional fishing gear called "Arte de Sacada" together with a "Lancha de Sacada". This traditional and obsolete fishing gear uses a kind of seine nets launched between two boats, a Saveiro and another little open boat, meant to catch mackerel and horse mackerel with a help of a spotlight and sardine bait. Each boat had 4 to 5 men and all the process was wind directionated since they used the sails to tack and luff the boats. The Saveiros had usually a lateen sail (triangular) or, less common, a square sail (carangueja, portuguese name). Its construction, although primitive, aimed to maximize the boat's aerodynamics, seaworthiness and stability, making the most of the used material - wood. Its' colors are bright and very characteristic and the most common used colors are blue, red, white and yellow. Nowadays, there are still a few proud fishermen who have some of these boats, but most of the times they no longer used for fishing. 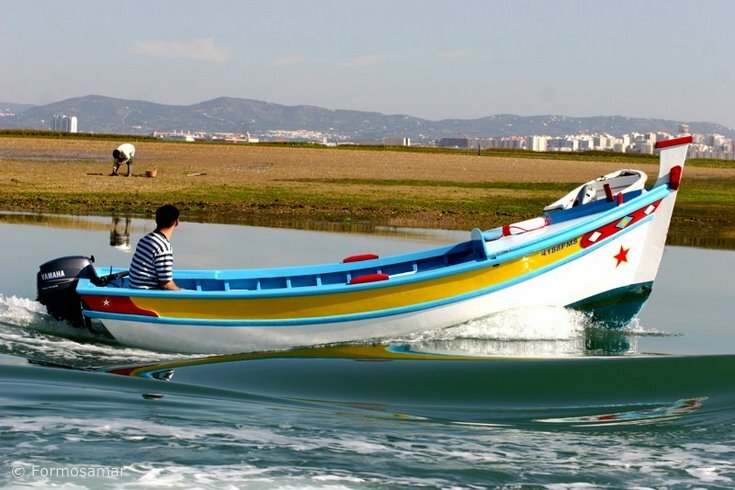 Adjusted to the present, with a outboard engine, these boats are now used to color the Ria Formosa channels and disclose the secrets of this Nature Park. With the start of the 2014 season, our team @ Formosamar is now busy repairing these sea ancients. This is hard work and once it's built in wood, the boats need annual repair. After the boat is taken out of the water, it will dry for a couple of days. The first step after that is the sanding of the old paint followed by the first coat of paint. In the end, we apply the anti-fouling and the boat goes back into the water and it's ready to explore the channels of these beautiful area with our guests. Sophie Law of the Sunday Independent visited the Algarve and decided to explore the Ria Formosa on a Kayak Tour with us. She later wrote her experience with us. With her paddle pointing up like an arrow into the blue sky, Anna called out, “Look! a little tern, just above the ...” My eyes glanced from the direction of the paddle back to her face – her mouth was moving, mime-like, the words drowned out by a deafening roar coming from where she was pointing to. It was a Wayne’s World moment. But we weren’t reclining on the bonnet of a car musing on “Baberaham Lincoln”; we were floating in an Atlantic inlet in kayaks, with a Ryanair jet coming in to land at Faro airport, just metres above us. We were cruising through the Ria Formosa, a tidal lagoon landscape that drapes like a crochet collar beneath the eastern Algarve’s coast for 60km from the capital, Faro, east towards Andalucia. Protected as a natural park, the “beautiful river” is hemmed in from the Atlantic by five barrier islands and two peninsulas that are all blissful stretches of pale sand rippled with dunes, swaying tall grass and fragrant herbs. Despite its proximity to the airport, where flights seem to take off and land almost as frequently as the birds in the lagoon, the park is a haven for wildlife. Anna, a microbiologist studying at Faro University, spends her spare time taking tourists out on the Ria Formosa in kayaks with local tour operator Formosamar. Thousands of migratory birds come here throughout the year en route to or coming from Africa, including greater flamingos which wade about in the saltmarshes between August and March. The tidal landscape is also remarkably biodiverse, its habitats a patchwork of marshes, sand dunes, brackish lagoons, tidal flats and islets that host all sorts of flora and fauna. At its most idiosyncratic, this includes Portuguese water dogs, the breed with webbed paws that President Obama famously chose for his family when they moved into the White House. Beneath the water lurk seabass, bream, seahorses, crabs and clams. Shellfish farming is big business here and the only concession to construction is a smattering of warehouses on the outlying islands. And all this less than 30km from the neon and concrete of Albufeira. As we paddled out from Faro’s tiny marina beneath a railway track and into a harbour, the high tide fizzed in the bright sunlight and fishing boats puttered in and out of range. Seabass jumped up and plopped back into the water as our paddles eddied their breeding ground. Arching out of the water were banks of samphire-like succulents topped with red and yellow flowers. “They’re pretty, aren’t they? But actually they prevent the plants from drying out when low tide exposes them to the hot sun,” Anna explained. As we drifted through channels between them, rods of bright yellow thrust up from sandbanks like golden foxgloves, a parasitic plant known as lamb broomrape, found only in this part of the Iberian peninsula. As our (or rather my) arms tired, we traded paddles for a motor and hopped into a small fishing boat. The tide was starting to pull back as we approached Faro Island – actually a peninsula that bookends the lagoon to the west. Anna dropped anchor just offshore and we paddled through the clear water up to the beach. A few small houses lined the sweep of sand as it tailed off towards the mainland like a golden horn. As we crested the top, the Atlantic came into view on the other side, heaving on to the shore around 20 metres away. Towards the end of the peninsula, a previously undisturbed couple soaked up sun and solitude. This certainly wasn’t the Algarve of clichéd description. As far as the eye could see, there were no golf courses, no tower blocks and not so much as a whiff of a fry-up. Only the airport served to remind me that this is Portugal’s most popular tourist destination, ushering in 2.8 million visitors last year. As if a plug had been pulled, the water was going down. We clambered back in the boat to head back to the marina. It was disorienting, the lagoon suddenly reduced to a network of channels that laced between fields of bottle-green vegetation. Anna turned the tiller so that I could see fiddler crabs scuttling up the mud banks. Above us, egrets, spoonbills, seagulls and a couple of storks began to swarm in, as gravitational forces revealed the spread of their supper. As we pulled back into the marina, a stork was catching the early evening glow from her enormous nest at the top of a street lamp. The Algarve’s capital feels distinctly Portuguese, a city of small- scale buildings, pretty plazas, pedestrianised cobbled streets and brightly painted churches. And even beyond Faro, behind the buffer of the Ria Formosa, this part of the Algarve has been left relatively unscathed by the brutalist architectural tourist tornado of the 1960s. A 10km drive inland, past fields of wild flowers and agricultural silos, brought me to a pink neo-rococo palace in the little town of Estoi. Now run as a pousada (a traditional small hotel), the dreamy 18th-century house sits on a low hill, surrounded by orange groves, French-inspired gardens and flitting birds. It was the perfect place to take in the tranquillity of the eastern Algarve as the setting sun turned the Ria Formosa gold below. Are you holidays on the Algarve? Make sure you do not overlook Faro and the Ria Formosa Nature Park. Diane Dalgleish, the editor of The Online Travel Journal, got in touch with us and asked why.